I just recently read the article by Ron Jeffries: A Metric Leading to Agility. It’s a good, well written, well thought out article. If you are in the software business, check it out if you haven’t already. However, much as it is good advice, I believe that I must add a cautionary note. The title of the above article, and the metric suggested (Running Tested Features), imply some pretty serious questions: why agility? Aren’t we really trying to help organizations succeed? Isn’t agility just a means? 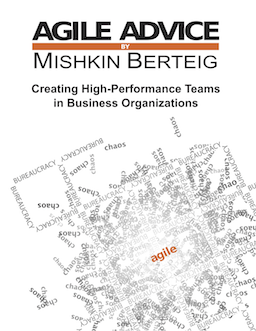 I’ve seen organizations adopt Agile in some form or another for lots of different reasons. The best reason is because it is recognized as a means to succeed. However, as a means, you don’t want Agile to drive change in your organization. Something else should be doing that. Some need, some failing, some gap or some pain. And that need should be measured. Running Tested Features as a metric is indeed powerful: it is difficult to “game” and it seems to promote the delivery of features, which presumably are valuable. The problem comes with the presumption of value. What if you end up choosing the wrong features? What if you are using agile on a non-new-product, non-software project? What if you don’t care what method you use, but you want a metric that will drive success (and might as a by-product encourage Agile approaches)? When looking at an organizational level, suddenly Running Tested Features seems like it might be a little beside the point. Mary and Tom Poppendieck in “Lean Software Development” discuss using financial models to help drive a team’s work to become more Lean, more Agile… and specifically to be aligned with what is going to bring success to the organization. Using metrics to drive behavior or performance is tricky business. Simpler is better, fewer is better and directly related to overall organizational goals is better. Measuring Running Tested Features can indeed drive a team to become more agile, but that might not be the best thing for the organization, or it may not be applicable to the organization. There is no One True Metric. Each organization and team has to find out what works best based on application of principles and experimentation. One metric that leads to agile? Maybe. One metric that leads to success? That’s what your organization needs to find for itself. See also: Appropriate Metrics, The One True Metric.